LG LFC24770ST: Is It the Best LG French Door Refrigerator Model? Home Reviews LG LFC24770ST: Is It the Best LG French Door Refrigerator Model? While LG may be best known for its mobile and entertainment devices, the company actually has quite a robust line of home appliances. When it comes to refrigerators, there are over 70 available on their website alone, 44 of which are just French door refrigerators. Needless to say, when it comes to purchasing an LG refrigerator, you have a lot of options. If you’re looking for a midpriced, French door refrigerator with enough space to comfortably accommodate a household of three or four people, the LG LFC24770ST might be the right choice for you. In this review, we’re going to take a closer look at the LFC24770ST by exploring its features, specifications, price, how it compares to similar refrigerators, and its pros and cons. Taking those factors into consideration, we’ll provide a rating and some overall thoughts on the product. 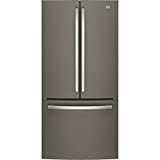 The LG LFC24770ST is a three-door French door refrigerator, and like most French door models, its refrigeration compartment is on top, while the freezer is underneath in a large pull drawer. The LFC24770ST has a 24-cubic-foot capacity and is considered to be a large capacity refrigerator, while still managing to measure less than 33 inches in width. It bears a clean and modern aesthetic, uninterrupted by a thru-the-door ice and water dispenser. In terms of storage, the LFC24770ST’s refrigeration compartment has four adjustable shelves made of SpillProof tempered glass, a Glide N’ Serve drawer, two humidity crispers and eight shelves/bins in the door (including multiple gallon-sized shelves and a dairy bin). The freezer contains two drawers, an automatic icemaker and an ice bin with a 12-pound ice storage capacity. The icemaker produces 2.8 pounds of ice daily in its normal mode, and if you need ice more quickly, you can switch on the Ice Plus feature to increase ice production to 3.1 pounds daily. For additional convenience, the LFC24770ST has been constructed with some handy engineering and digital features. The refrigerator is built with an “auto closing door,” allowing it to close itself with just a minimal push from you. The freezer can be easily accessed by simply lifting the Smart Pull handle — no forceful tugging required. The LFC24770ST’s LoDecibel Quiet Operation means that it will run fairly quietly at a noise level of about 42 dBA, which is quieter than refrigerators constructed with conventional inverter compressors. The LFC24770ST also features a door alarm (which will go off after the door has been left open for a certain amount of time), digital temperature controls and Smart Diagnosis in case you experience a minor problem with the appliance. If you do encounter a problem with the LFC24770ST, you can use LG’s Smart Diagnosis app on your smartphone to walk you through the steps of getting your fridge into diagnostics mode so that you can first diagnose what’s wrong, and then implement a simple fix by yourself or with over-the-phone assistance from a technician. Such a self-serve function could potentially be a great time and money saver and a blessing for those who might otherwise need to request time off work to wait for a service call. Both the refrigerator and freezer are lit with premium LED lighting, which is brighter, is more energy-efficient and produces less heat than traditional incandescent lighting. The LFC24770ST is Energy Star qualified and features Smart Cooling Plus technology, which works to maintain the prime temperature and humidity levels to keep food fresh longer. While digital sensors continuously monitor the conditions of the refrigerator’s interior, the dual evaporator and linear compressor respond in order to control humidity. To assist in this control and monitoring, the LFC24770ST contains four separate temperature sensors and is designed with multi-airflow cooling. The LFC24770ST has a height of 41.25 inches (including the door hinge) and a width of 32.75 inches. Its depth without handles is 33 inches, its depth with handles is 35.5 inches, and its depth with the door open is 46 inches. The LFC24770ST is available in two colors: "smooth white" for those with classic tastes and stainless steel for those who admire a more contemporary look. When purchasing in store, make sure to call the store first with the model number to make sure they have it in stock, as well as a floor model for you to look at in person. When you are ready to purchase, it’s also a good idea to find out if the business offers installation and haul-away services to get your old fridge out of the house. If it’s not all that important to you to have a refrigerator that’s completely shiny and new, you may want to consider purchasing a preowned refrigerator. 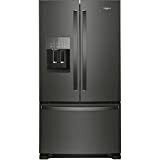 Through websites like Best Buy and Sears Outlet, you can find preowned LFC24770ST refrigerators in various conditions. Best Buy refers to these models as “open-box,” and sometimes that’s the only thing that ever really happened to the refrigerator: the box was opened, and the customer decided they didn’t want it anymore. For example, an open-box refrigerator in “excellent” condition at Best Buy appears brand-new and still has all the original parts and accessories. Sears Outlet goes into a little more detail about each preowned appliance’s condition, such as stating “dent on side” in the individual product’s notes. For some models, Sears Outlet also offers a leasing option. It has lots of storage and shelf space. The storage and shelves are sensibly constructed, offering you flexibility. The fridge has plenty of gallon storage, and the heights of the shelves can be adjusted for taller, harder-to-fit items. It has an impressive icemaker, capable of making a lot of ice and fast. This data speaks to the LFC24770ST’s ability to please customers and meet their needs. Overall, the LG LFC24770ST is a well-designed French door refrigerator with features for ease of use, such as the auto-closing door and the freezer’s Smart Pull handle. It has a good build quality and an outstanding warranty, and though lacking in more cutting-edge digital features, it does have a door alarm and Smart Diagnosis, as well as excellent storage capacity and a highly productive ice machine. The biggest downside is LFC24770ST’s lack of a built-in, filtered water dispenser. However, there is plenty of room inside the fridge for more than one filtered water pitcher. Given this refrigerator’s build quality, features, price point, and overall customer satisfaction and willingness to recommend the product, we’re giving the LFC24770ST a 4.5-star rating. People who purchase this refrigerator are very likely to be satisfied. LFC27770ST is one of the best fridge that LG has to offer, it has different features that will surely delight every customers who are going to purchase a piece of it. This product has plenty of gallon storage, and the heights of the shelves can be adjusted for taller person and it has an impressive icemaker, capable of making a lot of ice. However, this fridge is not app compatible with Google Assistant or Amazon Alexa unlike other fridge.